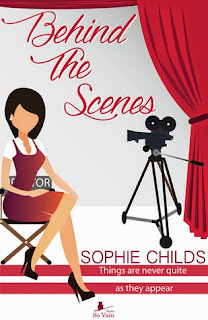 Book Drunk: Review ~ Behind the Scenes by Sophie Childs. Things are never quite as they appear. Bethan Brooks works in London for the ultimate boss from Hell, trying to support her wannabe rockstar boyfriend. But are The Vampire Squirrels really ever going to make it big or is she doomed to be a secretary forever? Luckily, Bethan finds the perfect escape when going to the cinema. There she loses herself in another world and forgets all about the dreaded filing and monotonous office work. Imagine her surprise when one day she encounters her favourite actor on the Tube. Suddenly, she finds herself part of the glamorous movie world she only ever dreamed about. With more at stake than she could ever realise, does she really want to know what goes on behind the scenes? I love books which have a take on career-based dreams rather than just falling in love and Behind the Scenes fit the bill. It was a light-hearted, fun read with well-drawn characters and plenty of drama throughout. The story takes off pretty quickly, when on a Tube journey to work, main character Bethan meets Vincent Constantine, an upcoming actor she’s a huge fan of. She soon has another chance encounter with Vincent which later transpires to her getting the chance to become assistant to him and his wife, the life of dreams with movie sets and film premieres and maybe a bit of dry cleaning and early, wasted wake-up calls too. Behind the Scenes was a fun, escapist read and one I really did not want to put down. There was lots I liked about this book. I enjoyed reading all the descriptions of Bethan’s new job, the things she’d have to do as assistant and the lives of the celebrities she was meeting. Though I obviously don’t have much knowledge of the celebrity world, in some books I find the personalities of famous people to be really overdone and a little cringeworthy but in Behind the Scenes, we get a contrast of the more laid-back actor Vincent along with his wife who is very demanding and a little full of herself at times. It was a lot easier to read in this book and I found it fascinating to read. Another aspect I really liked was the celebrity name-checking and mentions of some familiar London locations. This is again something I’m often not that keen on in books but I thought in this case it really helped me built up a picture of the scenarios in the novel and even routine things like the stresses of London commuting were easy to relate to and written well. I read this book in two sittings and that was mostly thanks to the character of Bethan who I really did like, but at the same time I kind of wanted to tell her off a lot of the time to. She had a really nice personality and was trusting and mostly helpful – a character pretty difficult to dislike but she was also a bit of a pushover and the way she let people treat her was infuriating (if possibly quite similar to the way I act sometimes…). Her boyfriend Lee always seemed to be full of excuses, her best friend Maria could be a bit cutting and really almost everyone she seemed to know tried to push her around. I sympathised with Bethan and really wanted her to stand up for herself. She needed to take some chances, more than just the mistakes glaringly obvious to everyone but her. I loved the author’s writing of all the characters and how I was always wondering if there was more to them than it seemed. Learning about which characters could be trusted was a bit of a running theme throughout this book and there were a couple of characters that I really wanted to be trustworthy but I was so anxious they wouldn’t be! I just found the story engrossing and wanted the best for Bethan. Behind the Scenes was, for me, a really lovely story about chasing dreams and discovering yourself, for lack of a less-clichéd way of putting it. It’s entertaining, quite dramatic and with a few twists that I could kind of see coming but really didn’t care because I still enjoyed reading it. I LOVED the last few chapters and throughout the whole highs and lows seen in this story, I was always reading with a smile on my face thanks to the author’s charming style of writing.